April 16th is National Eggs Benedict Day. Credit for this recipe is given to Chef Charles Ranhofer of Delmonico’s Restaurant in New York City—which also happened to be the first restaurant opened in the U.S., starting with a small pastry café in 1827 and expanding into a restaurant two years later. People ate all their meals at home or, if traveling, at the inn or hotel. Otherwise, hungry people got food from street vendors. In the 1860s, a regular patron of Delmonico’s, Mrs. LeGrand Benedict, arrived for lunch and found nothing appealing on the menu. She discussed her tastes with the chef, who created on the spot what would become an iconic recipe. In his cookbook, The Epicurean, published in 1894, he called the recipe called Eggs à la Benedick, inadvertently misspelling her name. The recipe is relatively easy: toasted English muffins topped with a round of cooked ham “an eighth of an inch thick and of the same diameter as the muffins one each half.” A poached egg is placed atop each each muffin half, and the whole is covered with Hollandaise sauce. Here’s an updated version of the Eggs Benedict recipe, substituting a portabella mushroom for the English muffin. Try this recipe for Corned Beef Hash Eggs Benedict. 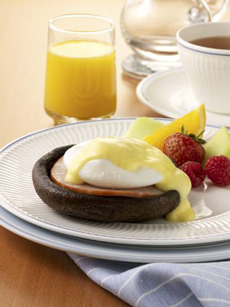 Skip the carbs with Portabella Eggs Benedict. American Casual: Burger Eggs Benedict. Luxury: Surf & Turf Eggs Benedict (lobster and filet mignon). Comfort food: Grilled Cheese Eggs Benedict. Scandinavian: Icelandic Eggs Benedict, with smoked salmon and skyr.